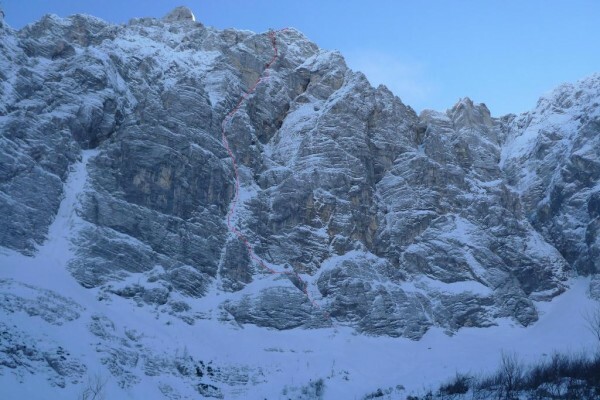 Climbing in alpine style, the two needed a total of 33 hours spread out over three days (30/01 – 01/02/2011) to get to grips with this very direct line up the kilometer high North Face of Triglav, the highest peak in the country. The route climbed on Triglav is not a new route but it shares more or less the ground of the combination of three existing summer rock routes, but the combination is a totally obvious winter line which follows a couloir/crack system straight from the bottom all the way to the top. The first section follow the summer route Sakalaška (summer V+), the second is the rarely repeated Varianta Fajdiga-Pintar (a summer VI), while the top section is the famous Čopov steber (a summer VI+). This is the most famous climb on the entire North Face and it marked an important moment in Slovenian climbing. Luka and Andrej were very lucky with conditions. Most of the route was covered in steep snow, except for the circa 300m high headwall which is mostly rock, although some small ledges are covered in spindrift. Ice axes and dry tooling proved the best solution for these conditions. They climbed it all free, no aid at all, which in winter is an important detail. The main difficulties were connected to the steep snow on the lower sections: although the climbing wasn't super hard, it was dangerous. Finding solid protection was difficult and the climbers spent a lot of time searching for rock pro beneath the snow, which on the Triglav limestone is hard to find. The first 2/3 of the route was mostly snow, some 90° section, a lot of 80°. The upper section then presented mixed climbing and although it was technically the hardest, mentally it wasn't seeing that there were many pitons placed in summer. When in proper conditions (full of packed snow) Sanjski Joža (Dream Joža) is one of the most impressive and hardest winter climbs in Slovenia.